HOUSTON, Nov. 13, 2017 /PRNewswire/ -- LyondellBasell (NYSE: LYB), one of the largest plastics, chemicals and refining companies in the world, was the presenting sponsor of The University of Texas MD Anderson Cancer Center's second annual Boot Walk to End Cancer® which raised a total of $925,000. 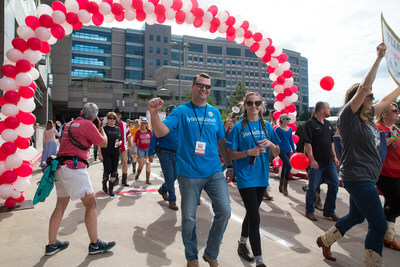 More than 5,000 participants wore their favorite pair of boots for a 1.2-mile walk in the heart of the Texas Medical Center. One hundred percent of funds raised from the event will go directly to support cancer research, diagnosis and care. "Every family has seen a loved one or a friend battle cancer and we are proud to help support MD Anderson's mission to eliminate this disease," said Bob Patel, CEO of LyondellBasell. "By supporting and participating in the Boot Walk, our employees are demonstrating our belief that finding a cure is possible through the power of many." The event took place at the MD Anderson medical campus in Houston and the route accommodated a diverse group of walkers who wore their favorite pair of boots. Cowboy boots, rain boots, combat boots and many more were seen at the event. Approximately 200 LyondellBasell employees, family members and friends participated in the event, donning their blue Nomex® coveralls and volunteer shirts. 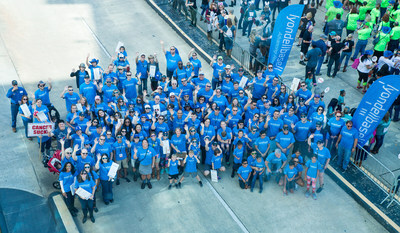 Following the walk, a day of activities including entertainment, music and food allowed participants to celebrate their hard work and fundraising efforts. "It was an honor for LyondellBasell to be a part of this important event and we were especially proud to walk alongside those participants who have survived cancer," said Jeff Bonorden, global director of Health and Medical at LyondellBasell. "We are thrilled so many people from across the community supported MD Anderson's Boot Walk," said Marshall E. Hicks, M.D., president ad interim of MD Anderson. "We are grateful to our presenting sponsor, LyondellBasell, and its more than 200 employees who joined us this year to give cancer the boot. Their commitment of time and resources is what helps make these type of events such a success in our efforts of making cancer history." In addition to the Boot Walk, LyondellBasell launched a company-wide "Join the Fight" campaign designed to raise awareness about cancer. The campaign targeted the company's 13,000 global employees, their family members and contractors and provided information about various types of cancer. During the October "Pink Out" employees at the company's 55 manufacturing sites dressed in pink to honor and support those facing breast cancer. Each of the company's sites will distribute false mustaches in November for the "Movember" campaign which encourages employees to show solidarity with men who suffer from prostate and testicular cancer. LyondellBasell's global philanthropic efforts are focused in the areas of education, health and environment. Over the last three years, the company has supported more than 990 charities around the world, while more than 9,200 employees have donated approximately 40,000 volunteer hours to local community service projects. In 2016, the company's United Way campaign raised approximately $1.7 million for the United Way of Greater Houston and the company remains an active supporter of many other local organizations, including Junior Achievement of Southeast Texas, the Houston Food Bank and Theatre Under the Stars. Earlier this year LyondellBasell enhanced youth ball fields in La Porte, Texas, as part of the company's participation in the Astros Foundation Community Leaders program. The company also supported the Harris County Sheriff's Industrial Unit Deputies, the Houston Police Department and the Houston Fire Department through grants that enabled the purchase of needed safety equipment and specialized training. LyondellBasell (NYSE: LYB) is one of the largest plastics, chemicals and refining companies in the world. Driven by its 13,000 employees around the globe, LyondellBasell produces materials and products that are key to advancing solutions to modern challenges like enhancing food safety through lightweight and flexible packaging, protecting the purity of water supplies through stronger and more versatile pipes, and improving the safety, comfort and fuel efficiency of many of the cars and trucks on the road. LyondellBasell sells products into approximately 100 countries and is the world's largest licensor of polyolefin and polypropylene technologies. With approximately 4,500 employees in the Houston area, LyondellBasell is one of the largest employers in the region. More information about LyondellBasell can be found at www.lyondellbasell.com.